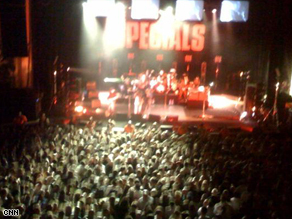 Band played hits including "Too Much Too Young," "Gangsters" and "Ghost Town"
LONDON, England (CNN) -- British new wave ska legends The Specials rounded off the Brixton leg of their 30th anniversary tour with an electric performance that threatened to bring the crumbling south London venue crashing to the ground. The six-piece 2-tone outfit originally from the English Midlands played a total of five dates at what is now the O2 Academy, such was the phenomenal demand for tickets. From the rarefied perspective of the VIP bar, the sea of bobbing heads and mobile phone displays (which seem to have replaced cigarette lighters) created a fantastic spectacle. But down among the rude boys and rude girls the carnival atmosphere seemed to ratchet up a notch with each song. Balding, sweaty 40-something men in Fred Perry polo shirts were transported back to the late 1970s as they bounced around unselfconsciously, while post-Margaret Thatcher indie kids sloshed their pints in the air and enjoyed this unique experience for the first time. No one was standing with their arms folded here. Despite songwriter Jerry Dammers' continued absence and Lynval Golding's lost voice, the band was as tight as it ever was, both musically and personally. As soon as the curtain rose the band wasted little time plugging into the hysteria that greeted them. If "Do The Dog" appeared to hit the spot, then tracks such as "Too Much Too Young," and "Gangsters" literally had the earth moving in this imposing old theatre. Terry Hall, showing no sign of fatigue after a recent throat infection and the band's homecoming gig in Coventry the previous night, was in a chirpy mood. The Manchester United fan enjoyed reminding the London audience about his team's league success that afternoon. Meanwhile, the irrepressible Neville Staple seemed to galvanize the rest of the band with his seemingly limitless energy -- he must have spent the entire gig running on the spot. The dapper singer has aged well and was clearly reveling in the band's return to the spotlight. Despite only reforming recently, The Specials have rediscovered their mojo. They possess the kind of stage presence reserved for the truly great acts, while their lyrics still resonate today. "Ghost Town" encapsulated the gritty reality of Britain's urban landscape in 1981, and few in the audience would have argued that it remains a relevant portrait in today's troubled economic times.